Since the Metropolitan Water Reclamation District of Greater Chicago (MWRD) was created in 1889, it has worked to clean and protect the local waterways by treating wastewater and managing stormwater. Much can change in 127 years, and the evolution of the MWRD’s work with solids generated by the wastewater treatment process offers a prime example of that change. The MWRD serves an equivalent population of 10.35 million people in an 883-square-mile area, covering nearly all of Cook County, IL, which includes Chicago and 128 suburban communities. To meet the demands of the vast amount of waste generated by the region, the MWRD owns and operates seven water reclamation plants and 22 pumping stations. The MWRD treats an average of 1.4 billion gallons of wastewater each day, with the capacity to treat over two billion gallons per day. For the past four decades, the MWRD has successfully used biosolids to reclaim land, support agriculture, enhance recreational areas, restore and replenish the tree canopy, partner with community gardens, create green landscapes, and use for educational purposes. There are more than 100 users fertilizing golf courses and athletic fields at public parks and school grounds with biosolids. A safe, nutrient-rich, organic product resulting from the wastewater treatment process, the use of biosolids leads to cost reductions, improved soil quality, and increased water retention. At a time when there is growing scrutiny over fertilizers and pesticides, we are supporting a natural trend that is both resourceful to our environment and also our taxpayers. Beginning in the 1940s, the early days of wastewater treatment, the solids generated were sent to landfills. However, in step with the environmental movement of the 1970s that saw the birth of the U.S. EPA and the Clean Water Act, the MWRD purchased 14,000 acres of strip-mined land in downstate Fulton County, IL, and set about restoring the severely degraded land back to usable real estate using MWRD biosolids. Known as “The Prairie Plan,” MWRD biosolids were barged 200 miles south along the Illinois River and were distributed over the property as a way to recycle urban wastes safely into the natural environment. The Prairie Plan transformed thousands of acres of strip-mined soil into productive agricultural land where corn, soybeans, wheat, and hay have flourished for decades. The project also produced some of the best outdoor recreational property in the state; the property is now home to abundant wildlife, including a healthy deer herd, wild turkey, quail, and waterfowl. The Prairie Plan received the American Society of Civil Engineers’ Outstanding Civil Engineering Achievement Award for 1974. At the same time the MWRD was developing and implementing the Prairie Plan, it had also developed a sewage sludge product called NuEarth, which was air-dried Imhoff sludge, and given away for horticultural uses. Between the 1970s and 1990s, however, scientists raised concerns about the levels of heavy metals that were found in biosolids throughout the U.S., so distribution came to a halt. In 1986, the MWRD implemented pretreatment and industrial waste programs that led to drastic reductions in the concentration of metals in biosolids. The trace metals found in most biosolids produced today far exceed federal Exceptional Quality standards. Trace metals such as copper, molybdenum, nickel, selenium, and zinc are essential plant nutrients that can be found in MWRD biosolids but at a fraction of the maximum allowable levels. MWRD biosolids provide soils with major nutrients such as nitrogen, phosphorus, and potassium, minor nutrients such as calcium, magnesium and sulfur, and with metals such as iron and manganese that serve as micronutrients and stimulate healthy soil. While the MWRD has been building its biosolids program for decades, the growth of the program was limited as the state of Illinois did not recognize all federal biosolids regulatory standards. That changed on July 20, 2015, when Illinois Gov. Bruce Rauner signed legislation amending the Illinois Environmental Protection Act adopting the USEPA Part 503 EQ biosolids standard to recognize EQ biosolids as a resource and not a sludge or a waste. EQ biosolids, according to federal and state regulatory standards, are a superior alternative to chemical fertilizers for turf grass in landscaping, parks, and athletic fields, as well as for agriculture. The legislation recognizes EQ biosolids as a safe, beneficial, and renewable resource that should be used locally and made available to the public. The new law is in line with federal standards, which provide that the EQ biosolids are “a resource to be recovered” that “can be used on land as a beneficial recyclable material that improves soil tilth, fertility, and stability.” This high-quality product will no longer be subject to more stringent regulation as a sludge or other waste and instead will be allowed for nearly unrestricted distribution. The composting program has sparked an entirely new enterprise from which to grow and expand, generate revenue, and ultimately protect the environment. The MWRD’s Board of Commissioners, a nine-member elected body that creates policy for the 2,000-person government agency, implemented a Resource Recovery Ordinance in October 2016. This ordinance allows the MWRD to accept vegetative materials, such as yard waste and other organic materials, for beneficial reuse. MWRD staff developed a program in which wood chips and yard waste such as leaves, branches, and twigs are composted with biosolids to produce a composted biosolids product. Through this composting program, biosolids will be used locally instead of being hauled to distant farmlands, thereby reducing the agency’s carbon footprint and providing the opportunity to distribute a product that is more economically and environmentally beneficial. The composting program has sparked an entirely new enterprise from which to grow and expand, generate revenue, and ultimately protect the environment. In addition to being used for healthy lawns and landscaping purposes, the compost is safe for use in growing food crops. In 2016, the MWRD partnered with ChicaGRO Intergenerational Growing Project to help convert more than 70 vacant Chicago neighborhood lots into backyard community gardens that use the compost in planting beds and growing vegetables. Brownfields that have languished for years are also finding new life through MWRD composted biosolids; the 87-acre Lake Calumet Cluster Site, home to five former U.S. steel plants along Lake Michigan on the Southeast Side of Chicago, is being restored from rocky terrain to a green space that will one day be a stop for migratory birds. At the MWRD’s Hanover Park Water Reclamation Plant, workers are developing a tree nursery that will flourish with the use of the composted biosolids. In addition, the MWRD has distributed more than 25,000 oak tree saplings as part of a new initiative called Restore the Canopy, Plant a Tree. The program, implemented in April 2016, educates the region about the importance of the tree population that has been decimated in recent years, as well as the lasting benefits that trees provide in managing stormwater. Each tree sapling is distributed in the compost blend. In 2016, the first year of the composting program, the MWRD met an internal goal of producing 10,000 tons of composted biosolids. In 2017, the goal is to produce and sell 50,000 tons, and in 2018, the goal is to sell 100,000 tons. At this time, the plan is to charge $30 per cubic yard, and recipients must complete a short application. In 2013, before implementation of the Resource Recovery Ordinance, the MWRD partnered with the City of Chicago to share tens of thousands of cubic yards of wood chips as a bulking agent for composting MWRD biosolids; the wood chips derive from 13 million ash trees lost in the city due to the emerald ash borer devastation. Because the mixing ratio is 3:1 wood chips to biosolids, the compost blend requires a steady flow of wood chips, yard waste, and other feedstock. The compost has a greater range of uses than either resource alone and helps reduce the city’s landscaping costs. 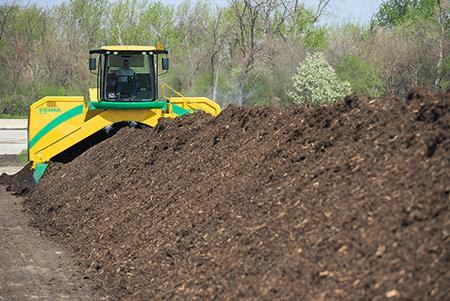 The biosolids composting operations are located at the MWRD’s Harlem Avenue Solids Management Area (HASMA) in Lyons, IL, and Calumet Solids Management Area (CALSMA) on Chicago’s south side. The composting process raises the temperature of the biosolids and wood chip mixture, killing off pathogens and meeting the USEPA Part 503 regulations for Class A biosolids pathogen reduction. The windrows are turned five times over 23 days, and the temperature is maintained at 55 degrees Celsius. Following the composting process, the product is left in open windrows for curing to complete the stabilization process. The final product is screened to remove large pieces of wood chips before distribution. Finding feedstock to create the compost has become a priority for the MWRD. There is not an endless supply of wood chips or trees so the new Resource Recovery Ordinance helps bridge that gap. The ordinance allows the MWRD to develop a program to collect wood chips and yard waste to blend in the compost process. To recover costs, the MWRD will charge a tipping fee of $20 per cubic ton to receive feedstock and create a new revenue stream through the sale of composted biosolids. Serving a large area means there is a wide base from which to search for this feedstock. The MWRD is reaching out to area landscaping contractors and tree-trimming companies, waste haulers, utility companies that trim trees, area paper mills, municipalities, and park districts. The MWRD is also installing a composting facility, which requires less energy than heat drying, at CALSMA. The composting facility will be a covered positive aeration system and will have the capacity to process 25,000 dry tons of biosolids per year. The process will require a 1:3 biosolids to feedstock mix ratio by volume and one temperature probe per pile, and necessary equipment includes mixers, loaders, and screeners. Additional market analysis will be performed to determine demand and potential revenue from the sale of the finished product, which is proving to meet the MWRD’s strategic goals in producing a Class A material, reducing and eliminating odors during solids management procedures, reducing transportation, creating readily available end-use products independent of weather variation, reducing operational land requirement and carbon footprints, increasing solids distribution within Cook County, and ensuring financial and environmental sustainability with a potential revenue stream. The goal is to achieve 70 percent local utilization by 2017 and 100 percent by 2018. 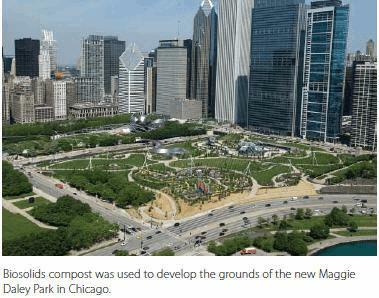 The future for generating income for the taxpayers of Cook County through biosolids composting is bright. More information about MWRD biosolids and composted biosolids is available by calling (708) 588-4201. Allison Hirsch Fore has served as the public & intergovernmental affairs officer at the MWRD for five years. She has more than 20 years’ experience in government communications, having also worked for the Illinois State Treasurer, Illinois General Assembly, Indiana Secretary of State, and Indiana Department of Environmental Management. She received her Bachelor of Science degree from Indiana University’s School of Public and Environmental Affairs and Master of Arts degree from the University of Chicago’s School of Social Service Administration.